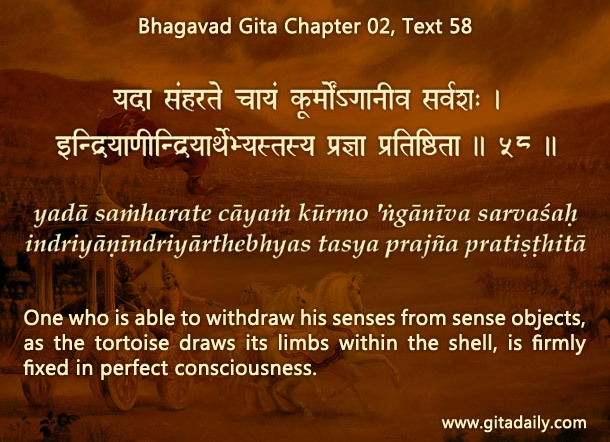 The Bhagavad-gita (02.58) uses the example of tortoise safe inside its shell to recommend that we keep ourselves spiritually safe by withdrawing our senses from the sense objects. Are we, then, to have no sensory activity? Not necessarily, though some spiritual paths that require rigid renunciation leave little scope for sensory expression. But bhakti-yoga offers the senses constructive engagements. Firstly it makes accessible at the material level manifestations of the divine such as the Deity, dhama and prasad. Secondly, bhakti emphasizes practical service to Krishna such as singing, dancing, cooking, decorating and speaking wherein we can give creative devotional expression to our sensory inclinations. In contrast to contaminating and entangling worldly sensory engagements, devotional sensory engagements are purifying and liberating. Still, despite having such safe avenues for sensory engagement, the regulation necessary to practice bhakti may make us feel cramped, as if we are living inside a shell. We may feel that just doing what our senses want will free us. However, letting the senses roam free sends us into another kind of shell – the shell of materialism. Unregulated sensory indulgence increases our material attachments and keeps our actions and even our aspirations restricted within the arena of matter, thereby depriving us of all spiritual fulfillment. Worse still, such a shelled existence is often self-perpetuating. Materialism impels us to karmic actions that sentence us to many future births in the shell of material existence. In contrast, the feeling of constriction due to sensory regulation is temporary, till our senses become purified. Once purified, they will no longer crave for material things and our consciousness will become joyfully transferred to the spiritual level. There we can delight in loving Krishna in a life of eternal freedom – freedom from temptation, freedom from degradation, freedom from matter, freedom from death and freedom from misery.